The remains of Thera, an ancient volcanic catastrophy. Click to hephaestenate. In my never-ending quest to show you every volcano on the planet as seen from space, I present the gaping wound in the Earth’s crust called Santorini, Greece. The photograph above was taken by an astronaut on the International Space Station in September. The image is roughly 18 kilometers across or so; the central lagoon is about 12 kilometers in diameter. What you’re seeing here is the remains of a massive caldera, the bowl-shaped depression left over after the Santorini volcano (also called Thera or Thira) exploded about 3,600 years ago. The explosion was tremendous, apocalyptic: 100 cubic kilometers of ash and rock blew out of the volcano, enough material to make a whole other mountain roughly 4 or 5 kilometers high! The explosive energy of the eruption is difficult to pin down, but from what I can find may have been the equivalent of more than 2,000 megatons —2,000 million tons of TNT. That’s dozens of times larger than the most powerful nuclear weapon ever detonated by humans. I’ve been to the island of Santorini (the largest of the three islands that were the rim of the caldera), and it’s spectacular. It rises out of the ocean like a wall, and life there is different; it’s a tad hilly, and getting from the port at sea level up to the top is easiest by cable car, if you like terrifying journeys. But it was fun and beautiful, and I found a street vendor that sold peanuts with sesame seeds baked on to them (I think also with some honey to help them stick) and they’re just about my favorite snack on the planet. Come to think of it, I got some of the same peanuts in Quito, Ecuador, years earlier, which is also on a huge volcano. Coincidence?! Well, yes. But anyway, standing on the top of Santorini in the town of Oia (the one with the famous blue-domed churches, which are every bit as striking as they appear in photos), it was hard not to have a sense of the cataclysm that befell the region all those millennia ago. 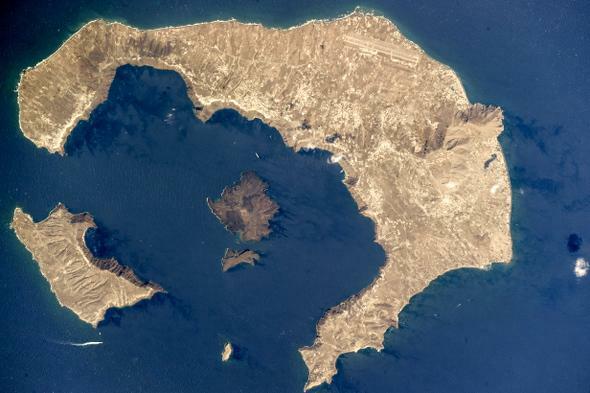 As the NASA Earth Observatory page points out, a Minoan-age town has been found, and archaeologists are investigating it. I’m actually shocked by this; I wouldn’t think an explosion of that size would leave anything behind, even buried in ash. But there you go. Physics isn’t beholden to our prejudices. I’ll be doing some more reading about this event, no doubt. It’s one of the largest volcanic explosions ever recorded in human history, and one of the few I’ve visited. I’m fascinated by the terrible beauty of volcanoes, as much as I am repelled by the devastation they can do. We live in an uneasy truce with the forces of nature, a dynamic equilibrium that can very easily tip one way or the other. I think it’s important to be reminded of that every now and again.